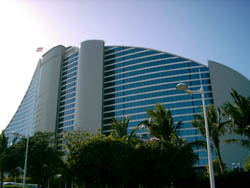 If you are visiting the UAE and have a good budget for accommodation, Dubai is world renowned for it’s luxury hotels. 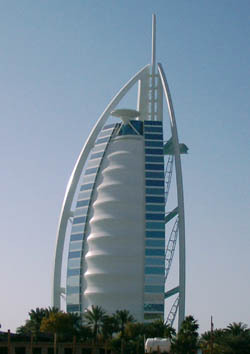 It boasts the worlds tallest hotel, the Burl Al-Arab which is also the worlds only 7 star hotel. It was designed to look like a sail as the country has a history of fishing and sailing. It is the iconic landmark which represents Dubai and can even be seen on number plates. Dubai is known for its luxury and its incredible corporate hospitality. Places such as the Burj Al-Arab offer a butler as standard for all paying guests. It has a restaurant, Al Muntaha which is 200 metres above the ground and definitely worth a visit if you happen to stay here. Most of the worlds major hotel chains have a presence in the region such as Hiltoin, Marriot, Le Meridien, Grand Hyatt and Kempinskly. If you’re looking for a luxury resort in Dubai then the Madinat Jumeirah is probably the best you will find in the whole of the middle east. The resort consists of 3 hotels (Al Qasr, Mina A’Salaam and Dar Al Masyaf) which are all have a 5 star rating. Each hotel as its own personality and is built in the context of Arabian courtyards. The resort has a beautiful man made waterway with abras (water taxis) and it is only a few minutes walk to the beach. The resort houses many restaurants and boutique shops. The Jumeirah Beach hotel is another 5 star hotel in Dubai that forms part of the Madinat Jumeirah luxury resort. The hotel has a ‘wave’ like shape and isn't too far from Sheikh Zayed Road. You don’t have to be a paying guest to enjoy the restaurant food. We would recommend having a shisha in the restaurant outside accompanied by a nice drink, either tea or coffee with the Burj Al-Arab hotel in the background whilst watching the beautiful sunset.